When the temperature begins to drop, you will probably find yourself using your air conditioning less frequently. However, you will still want to make sure that you are running your A/C frequently enough to keep your house cool. 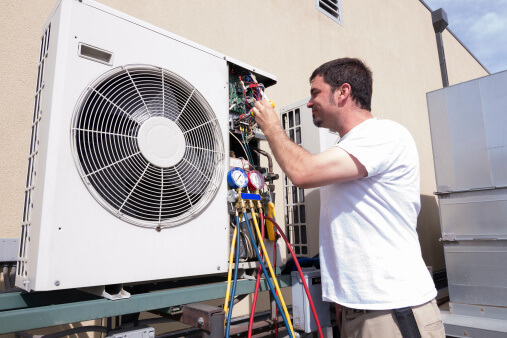 Here are some ways to ensure that you are running your air conditioning unit as efficiently as possible. Don’t run your air conditioning when no one’s home. Many homeowners leave their air conditioning units running all day long—even when no one is home—believing that this is more efficient. In fact, the most efficient way to run your air conditioning is to run it at full speed when you actually need it, rather than leaving it to turn on and off all day. Use ceiling fans. Ceiling fans do not lower the temperature, but they can make you feel more comfortable by circulating the air in a room. Using Energy Star approved ceiling fans while you are home can help you reduce your need to use your air conditioning unit. Since fans don’t actually make your house colder, however, you should always turn them off when a room is unoccupied. Keep a window cracked. One of the best ways to keep a room from overheating is to leave windows slightly open. If there are multiple windows in a room, try opening one from the top and the other from the bottom. Letting in cool outside air will help you avoid unnecessary use of your air conditioning unit. Russett Southwest is proud to provide first-class heating and cooling services to customers in the Tucson area. We have been serving the community for more than half a century, and we provide a variety of services to ensure quality indoor air. If your air conditioning unit is in need of service or repair, feel free to contact us at (520) 629-9676 or visit us online.